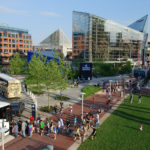 Rhodeside & Harwell’s design has artfully integrated the unique environmental education message of the National Aquarium in Baltimore, Maryland into an innovative ‘readable’ landscape design that improves a degraded urban site, incorporates sustainable systems and materials, provides public access and continues the exciting tradition of this Atlantic coast landmark. 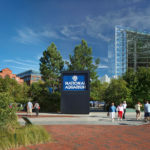 The National Aquarium in Baltimore is Maryland’s most visited attraction, hosting more than nearly two million visitors each year. 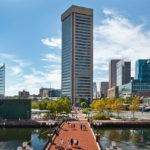 Since its establishment in 1980, the Aquarium has been an impetus for redevelopment and has become a landmark on Baltimore’s now bustling Inner Harbor. 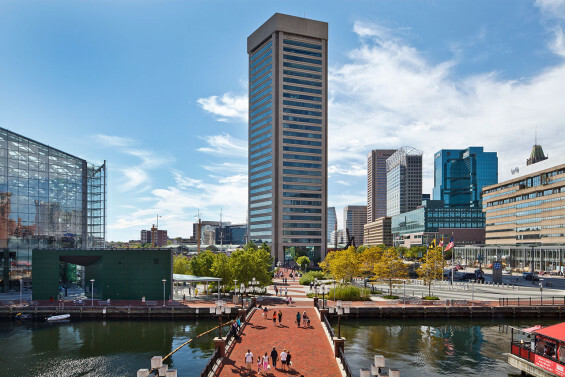 The building’s iconic architecture of bold concrete forms and sparkling glass pyramids has been a highly visible symbol of the city for 35 years. 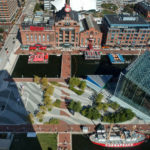 Prior to its renovation and expansion, however, Pier 3, on which the Aquarium is built, was a stark, paved expanse with little planting and few amenities, This was largely due to the fact that after a major fire in 1904 which devastated Baltimore’s waterfront, the pier was used to deposit debris and then capped with a concrete slab, leaving behind seriously compromised soil conditions. 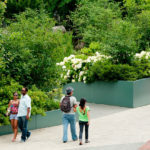 The goal of the expansion was to create new and exciting exhibits and to provide a welcoming outdoor space that is expressive of the Aquarium’s mission of environmental stewardship and at the same time, is comfortable, educational, and beautiful. 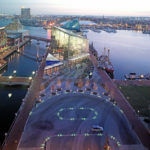 A new waterfront park was conceived that would create a memorable experience beginning upon arrival on the pier and continuing seamlessly through the Aquarium’s new ticketing area, main entry plaza, and into the newly expanded building. 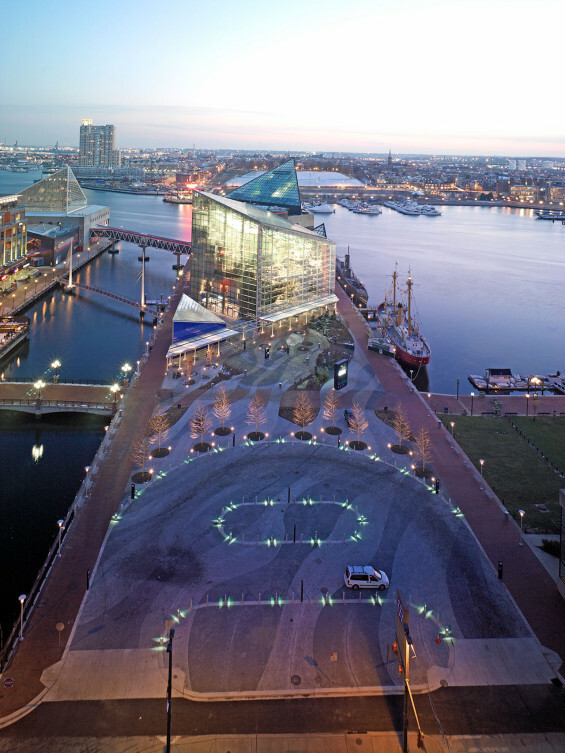 Interior exhibits are intended to visually and physically “spill” out onto the pier, and the design elements of the waterfront park are meant to flow into the new building. The east-west brick promenade connecting the piers of the inner harbor also bisects and surrounds Pier 3, playfully interacting with the waterfront park paving. 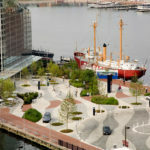 Generous seating located along the promenade and within the park provides many opportunities to watch the activities on the plaza or to overlook the harbor. Lighting, furnishing, changing graphic displays and seasonal programmed events in the park add interest and extend the public use of the space. 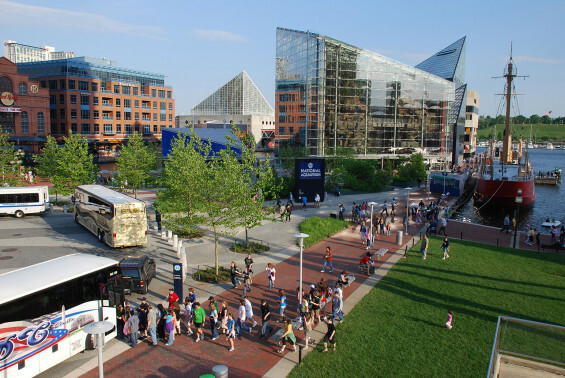 The thematic elements created for the new waterfront park explore Maryland’s diverse ecosystems from the Atlantic Ocean, Chesapeake Bay and Coastal Plain through the Piedmont region and Allegheny Mountains through interpretive signage. 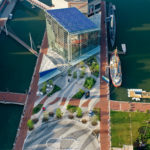 To carry this theme a bold, fluid paving pattern inspired by tidal currents, flows from the arrival court at Pratt Street, across the plaza and into the building across the floor of the new entrance lobby. From the curvilinear forms of the paving pattern, a progression of planting areas representative of Maryland’s distinct native ecosystems emerge; gently at first, then supported by curved steel retaining walls, they rise more dramatically to recreate the changing topography from shoreline to mountain ridge. Stone outcrops, fallen branches and a series of water elements included in the planters add to the effect of movement along an interpretive transect that culminates inside the lobby with a three-story high rock cliff and waterfall. To accommodate the heavy bus and vehicular traffic and the thousands of pedestrians that visit the waterfront park during peak periods, over 62,000 sf of precast pavers were used to create the curvilinear paving pattern. 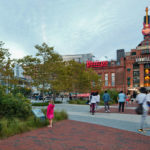 The custom designed pavers, were fabricated within 50 miles of the site and include locally quarried green aggregate and incorporate recycled lamp black and fly ash in their matrix. 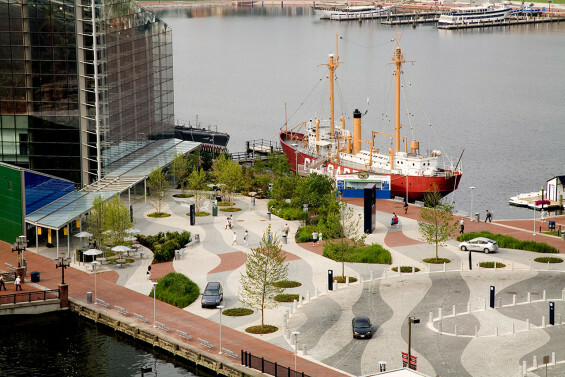 A permeable paving system was not practical due to the condition of the underlying pier structure, but the pavers are set on an aggregate bed over a concrete base to make it possible to remove and reuse them when access to underground utilities is necessary. Roof runoff is collected and stored in an underground cistern, providing water for the automatic irrigation system that supplies all of the planting beds. 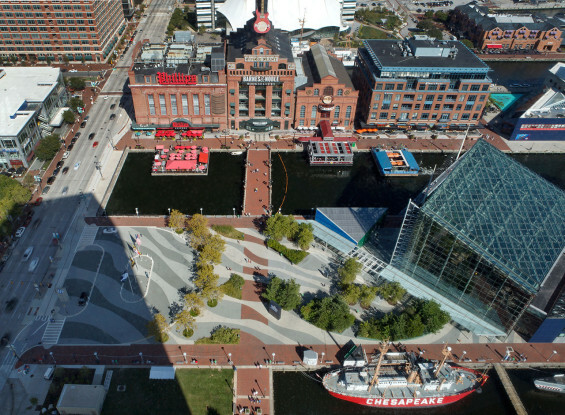 In addition, surface runoff from the plaza is directed into the planting areas to supplement the irrigation system and to filter it through the soil and aggregate layers before it is discharged into the harbor. 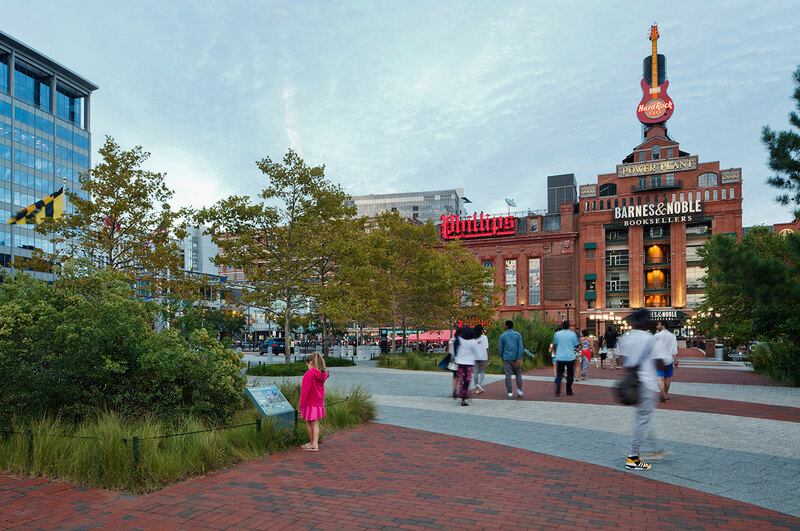 Over 6,500 sf of new planting areas were created on the pier, planted almost entirely with Maryland native species or “urban tolerant” cultivars of native species. As an added benefit, native birds and insects, rarely seen in urban settings have been observed nesting among the native plants on the pier. 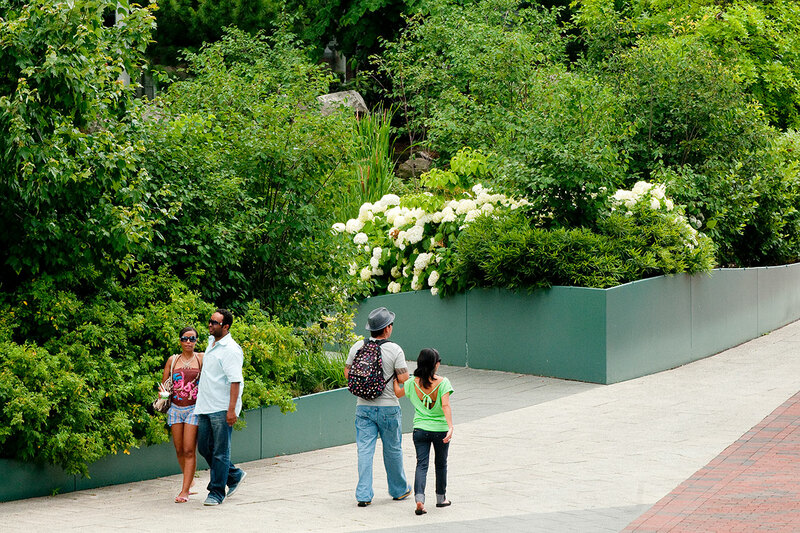 Site furnishings were selected for their high-percentage recycled steel content. New benches and trash receptacles feature an open mesh design that reduces heat build up and promotes ease of maintenance. Interpretive graphic panels within the planting beds and a large map of the Chesapeake Bay Watershed integrated into the paving provide first hand educational opportunities about the importance of preserving and restoring native ecosystems. 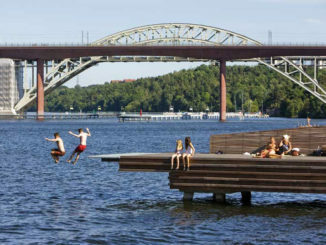 The size and location of each planting area was carefully considered to maximize their effect on the microclimate on the pier and to minimize the disturbance of the existing debris-filled subsoil and underground utility lines. 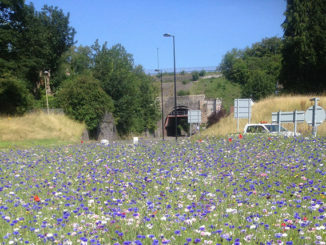 The planting areas are interconnected with an underground network of root paths. These are shallow trenches that have been excavated and replaced with uncompacted, amended soil and lined with aeration tubing, drain lines, and irrigation pipe. In total, over 9,000 square feet of improved subsoil was added to the pier. The paving is engineered to bridge over the root paths so that soil compaction was not required. 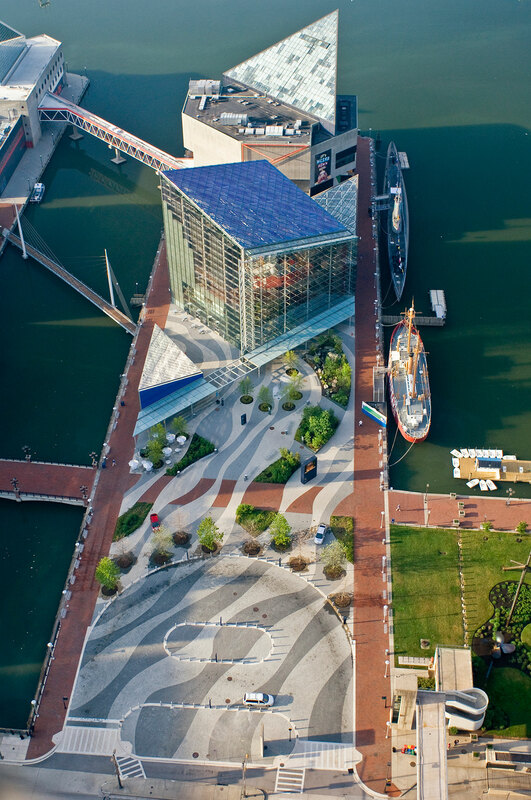 The signature “wave” paving pattern was created using two colors of custom-designed pre-cast exposed aggregate concrete units. 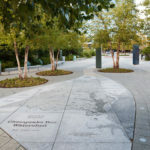 To emphasize the pattern of flowing lines, paver cuts were minimized by limiting them to the center “seam” and outer edges where the pavers meet other materials. 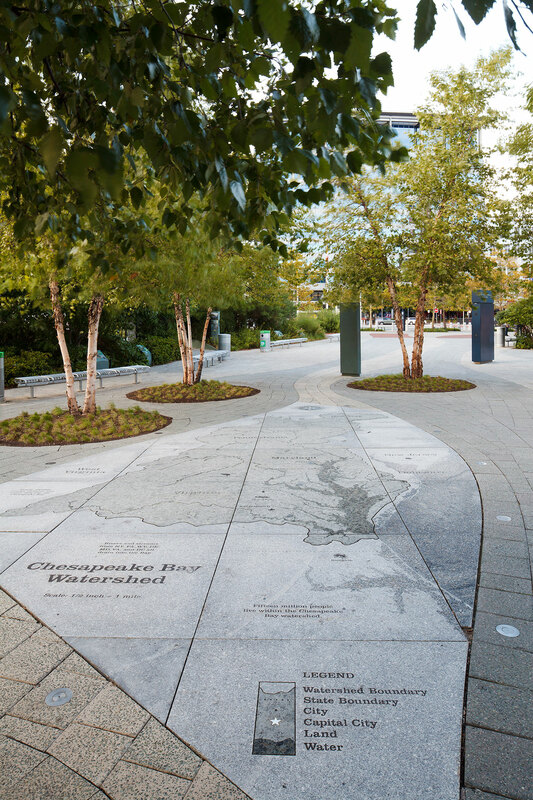 A monumental stone map, designed by the Rhodeside & Harwell, depicting the Chesapeake Bay watershed, is a favorite feature for children visiting the site. The map includes incised lettering, graphics and stainless steel inset interpretive markers. Special tints and coatings were applied to subtly highlight the granite surfaces. Chermayeff Sollogub and Poole, Inc.